For more than thirty years OOSS has grown up with, advocated for, and provided critical advocacy, network, and educational support for the entire ophthalmic ASC community. As the only professional society addressing the unique interests of this maturing community, OOSS communicates regularly with over 1,000 ophthalmic-only centers and another 500 multi-specialty centers with an ophthalmic focus. Of those, more than 500 centers engage regularly with OOSS, supporting advocacy endeavors, contributing industry intelligence, and participating in educational programs. At the heart of OOSS, are our members – our pioneers and our innovators. These people achieve incredible results every day, ensuring exceptional surgical experiences for patients and surgeons alike. 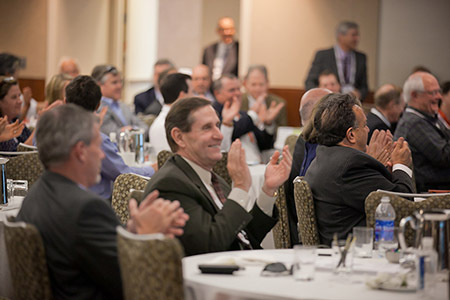 With such a strong and exclusive focus on the ophthalmic-driven ASC community, major association partners like ASCRS, AAO, and the ASC Association have embraced OOSS in advancing a collaborative advocacy agenda. Specialty societies such as the American Society of Retina Specialists, and those representing corneal, glaucoma, and oculoplastic surgeons, partner with OOSS in addressing specific areas of mutual interest. AECOS, ACES/SEE, as well as local and regional ophthalmic and ASC-related associations, engage with OOSS to share timely information and resources. Our industry partners recognize the critical importance of sharing expertise, products, and services with the ophthalmic ASC community and especially those centers that by their membership in OOSS demonstrate both prowess and passion as solid business models for the delivery of quality care. Industry partners actively support the advocacy agenda of OOSS while contributing substantial expertise and financial support to educational and industry intelligence endeavors. In exchange, OOSS provides industry partners with measured exposure to members and permission-based access to those most interested in the expertise, products, and service the partners have to offer. The profiles of industry partners vary – from small consulting organizations and medium-sized manufacturers, distributors, and financial services organizations to multinational corporations offering a wide range of product and services. Our member centers and the teams they represent reside primarily in the US and its territories with a small number in Canada and other countries. They come in all business forms: single-owner, practice-aligned, free-standing, multi-owner, and multi-practice ASCs. Most are ophthalmic-only, although a growing number of multi-specialty centers have joined OOSS. Through surveys, members tell us that they value the advocacy, information, education, and intelligence they gain through affiliation with OOSS. They also appreciate the highly personal and virtual qualities of OOSS that enable them to get answers or share input via the website, email, or a simple phone call.